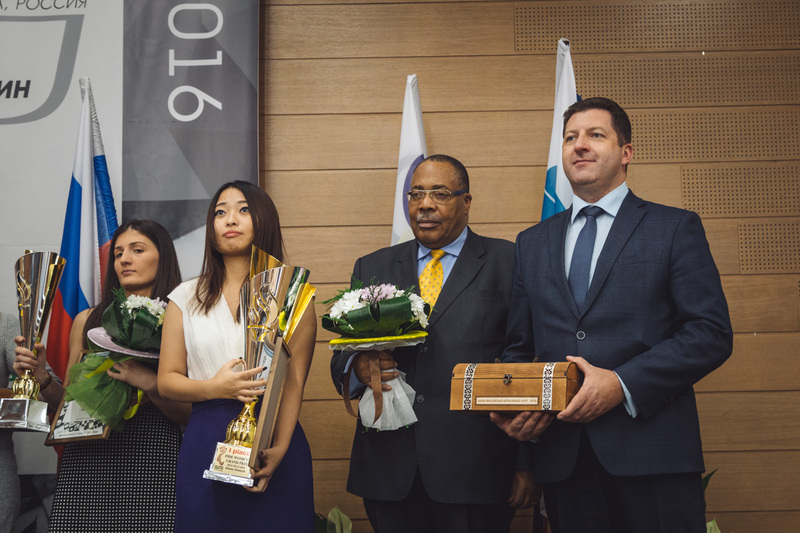 The winner of the FIDE Women’s Grand Prix series 2015/16 is announced in Khanty-Mansiysk. Magnus Carlsen has proved that he is a real chess king by winning the WCCM on the tie-break against Sergey Karjakin thus defending the title of world chess champion and world No. 1. Meanwhile Ju Wenjun of China has showed a worthy performance in the tournament in Ugra which was not very easy for her: she won not only the final leg of the FIDE Women’s Grand Prix but the overall series and qualified to the FIDE Women’s World Chess Championship Match that will take place in 2017. The final leg of the Grand Prix series allowed nobody to stay indifferent – neither spectators nor participants themselves. Four of them had chances to become the leaders of cumulative standings. No. 1 of the overall standings before the final GP leg Humpy Konery (India) could be beaten by her compatriot Dronavalli Harika, the Russian players Valentina Gunina and Alexandra Kosteniuk as well as Ju Wenjun, for whom it was enough to finish second in the last tournament of the series. 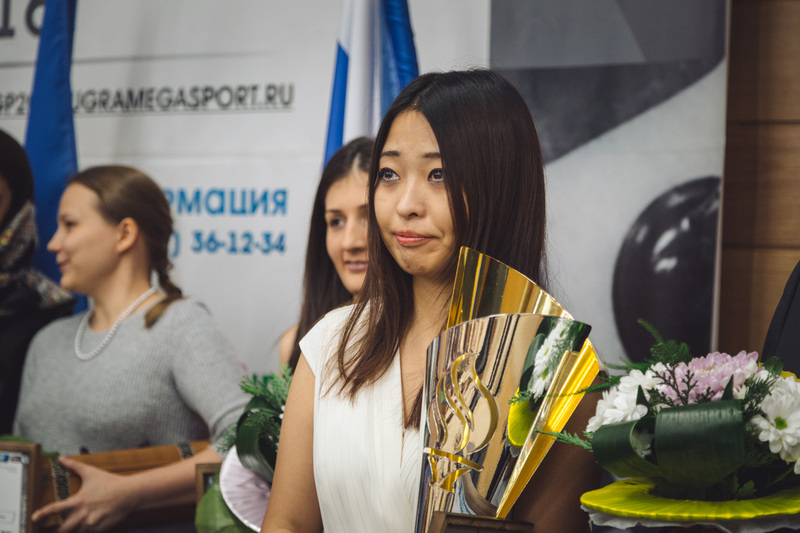 The start of the tournament in Khanty-Mansiysk was not very successful for Wenjun, and after her loss to Alexandra Kosteniuk she moved down to the middle of the tournament standings. However, having overcome the crisis, the Chinese player started to win one game after another! Four victories over Valentina Gunina, Almira Skripchenko, Sarasadat Khademalsharieh and Nino Batsiashvili led the rating favorite to a great success. The world champion Magnus Carlsen has started his road to big victories in Khanty-Mansiysk. Symbolically this city became lucky for Ju Wenjun as well. The last round of the final GP leg took place today, on December 01. Upon the end of all games the official closing ceremony and awarding of the winners were conducted. 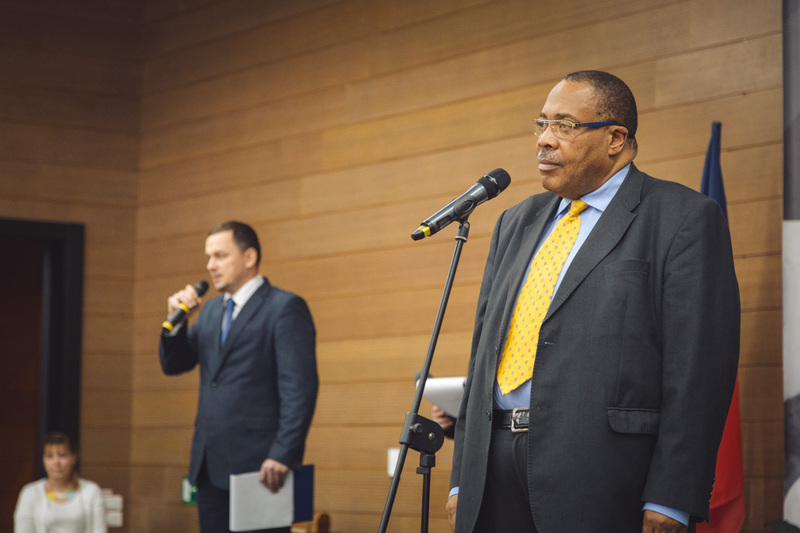 The Closing Ceremony was attended by the director of the Department of physical culture and sports of Ugra Igor Gubkin and the Chairman of the Appeals Committee and the Continental President for Africa Lewis Ncube. “Good evening, dear friends! We have completed our tournament. Over the past 11 rounds we were defining the best players among you. My congratulations that this ordeal has finally come to an end. It is the first day of winter. But despite of the calendar the weather of Siberia has showed what our climate is about. It was cold outside but inside of this playing hall the battles have been really hot. These were the battles of mind and strategy. We have tried our best to make you feel comfortable here. 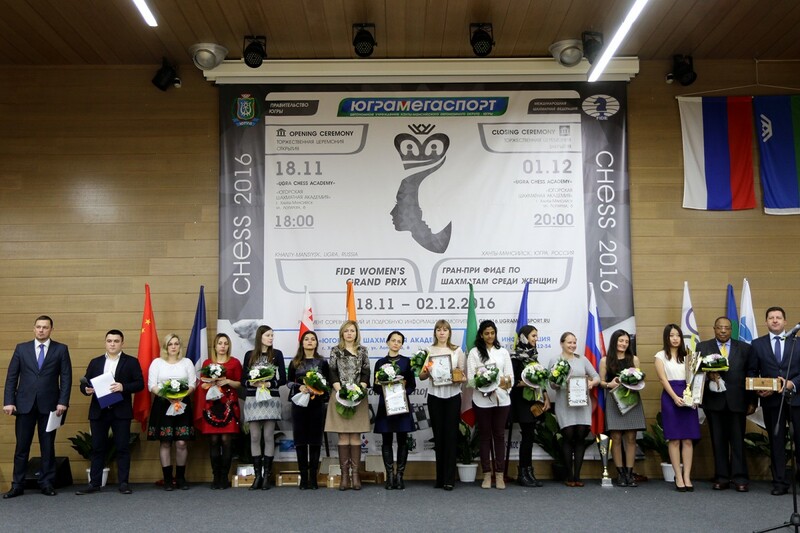 And remember that Khanty-Mansiysk is always ready to welcome chess players,” — addressed the participants the head of the Department of sports. “On behalf of the Presidential Board of the World Chess Federation I’d like to thank you for a wonderful organization of this tournament. Over the past two weeks we witnessed the top chess players of the world and very interesting games. As far as FIDE is concerned we are very proud of the games and Khanty-Mansiysk has also made the chess world proud by this wonderful organization. To organize a tournament like takes a lot of experience and skills. So thanks to the organizers. Besides, I’d like to thank the participants. Congratulations to the winners, because all of you are winners today. I am sure to see you once again participating in the next circle of Grand Prix and looking forward to another similar experience,” — said the Chairman of the Appeals Committee. According to the Regulations of the Women’s Grand Prix Series, the event consisted of five tournaments held in Monte Carlo, Tehran, Batumi, Chengdu and Khanty-Mansiysk. Each player participated in 3 of 5 tournaments. Ju Wenjun scored the most number of cumulative points (413,3 points) and became the overall winner of the Grand Prix. Koneru Humpy finished second with 335 points. Valentina Gunina got 287 points and took the third place. Ju Wenjun received the Grand Prix winner’s Cup. The winner and the future challenger of the Women’s World Chess Championship Match has confessed that her performance on the tournament was not very smooth. “I was under a lot of pressure not only because of this tournament but also because the final winner of Grand Prix series was defined here. First five games I felt very stressful and played a little bit conservative. After the game lost to Kosteniuk I suddenly relaxed and played more for pleasure and felt less pressure. I decided that my chances of winning the Grand Prix series were now so tiny so I stopped thinking about it and just played chess. Maybe that’s what made the future games easier for me”. The capital of Ugra says “good-bye” to chess but not for long. In June 2017 Men and Women World Team Chess Championships will be conducted here. 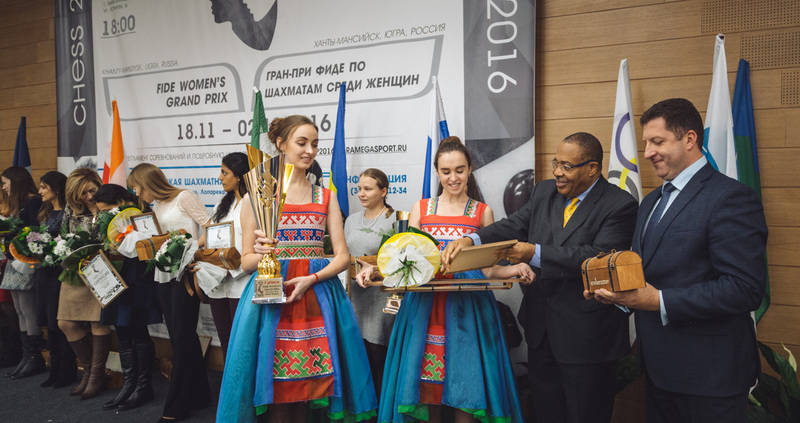 But the main event will be held in 2020 when Khanty-Mansiysk will host the Chess Olympiad.